Crisp teriyaki-flavored tofu bites are perched atop nori-flecked sushi rice for an invigorating meal in a bowl. It’s a lively combination of cooked and raw ingredients. Recipe originally published in January 2015 Vegetarian Times. Photo courtesy of Vegetarian Times. To make the Tofu Teriyaki, combine all ingredients except tofu in shallow container. Add tofu, and toss to coat. Set aside to marinate for 10 to 15 minutes, stirring once or twice. Remove the rice from the heat and stir in the vinegar, sugar, and salt. Stir in the nori and set aside. Heat large non-stick skillet over medium-high heat. Add the tofu and marinade, and cook 5 to 7 minutes, turning gently, until tofu cubes are browned and crisp on most sides. To serve, divide the Sushi Rice among six serving bowls. Top with Tofu Teriyaki, avocado, carrots, and cucumber. Garnish with extra nori, sesame seeds, and optional scallions. 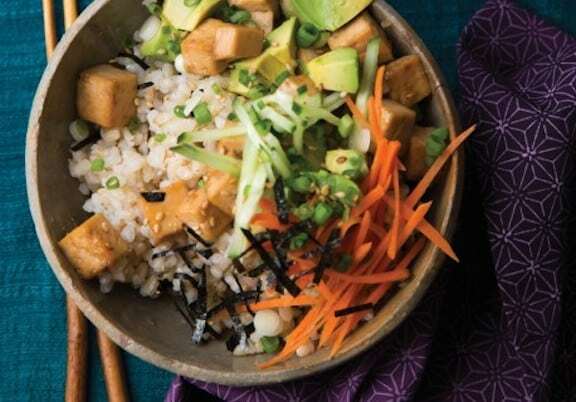 Here are more great recipes for vegan bowls.